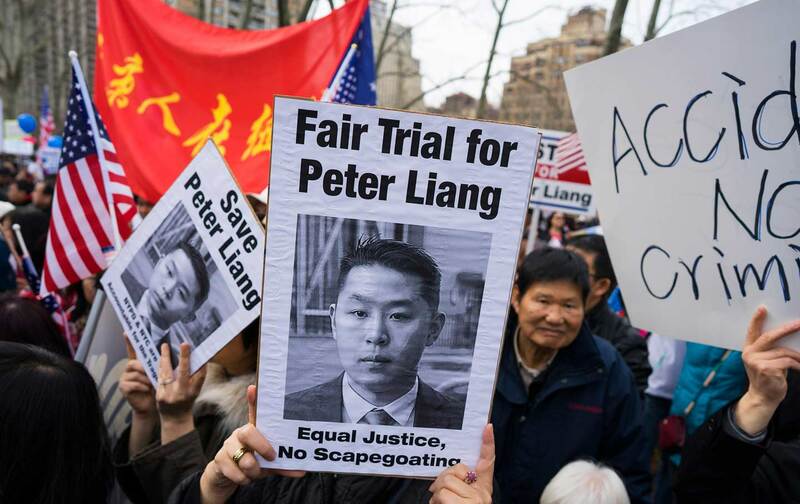 It’s been a month since former New York Police Department Officer Peter Liang was found guilty of manslaughter, but the movement to “save” him is gaining momentum. Liang, who in 2014 shot and killed Akai Gurley, an unarmed 28-year-old black man, is Chinese-American. He’s also the first New York City cop to be convicted in a police-involved shooting in more than a decade, causing many people in Asian-American communities to accuse the justice system of “scapegoating.” In the immediate aftermath of his conviction, thousands of supporters rallied in cities across the country, flooding the streets with signs that read: “Save Peter Liang,” “No Selective Justice,” and “One Tragedy, Two Victims.” Last week, amid continued calls for protest and massive social media support, Liang began to assemble a new team of lawyers to appeal the verdict. On February 5, I sat in a cramped courtroom watching his trial alongside other journalists, the Brooklyn district attorney, and supporters of both Peter Liang and Akai Gurley’s family. The basic events of the evening are not disputed: On November 20, 2014, Liang and his partner were patrolling a Brooklyn housing project when he shot Gurley in a dark stairwell. They did not attempt to resuscitate Gurley, and spent two critical minutes debating whether to call their supervisor while Liang said over and over again that he was going to lose his job. Gurley was later pronounced dead at the hospital. Liang maintains he fired his weapon by accident, and that he was in shock and inadequately trained to perform CPR. As the room waited impatiently for the defense to present its case, I caught a glimpse of Liang sitting next to his lawyers on the far side of the room. His head was bowed low, his back small. The sight of him conjured in me a familiar sense of despair. As a daughter of Japanese parents, I’ve often felt a deep sense of duty and obligation, perhaps a burden, that I couldn’t quite explain to my white peers. That is, for an Asian kid, there always seemed to be more at stake. The narrative of the model minority has been so deeply embedded into the Asian immigration story that it’s seeped into our collective psyche. Our “success” is a way of justifying why we’re here and why we belong. Our sense of worth is tied to the “success” of our people as a whole. To fail is to betray generations. It’s hard to explain the depth of filial piety, but it’s impossible to understand Asian support for Liang without it. Peter Liang is everything to his parents. As I watched Liang and his family in the courtroom, I saw my parents in his, myself in him. But no matter how deeply I felt this cultural kinship, I couldn’t defend him. The following week, Akai Gurley’s family and those of other victims of police shootings gathered outside the courthouse for a press conference. I stood by as cameras swarmed around them on the sidewalk, cars zipping behind them. Among those who spoke was Nicholas Heyward Sr., the father of Nicholas Heyward Jr., an African-American boy shot by a police officer in 1994. Like Akai Gurley, he was shot in the dark stairwell of a New York City housing project. He was 13 years old. More than 20 years later, Heyward Sr. was standing in front of the courthouse again, holding up a picture of his son in his hand. I felt the weight of one’s life being changed forever. Our “success” comes at a cost. What supporters of Peter Liang are asking for is to grant Liang, like Darren Wilson and Daniel Pantaleo, the license to take black lives at will. In other words, to defend Liang is to affirm the system in place. The final stage of our “success,” then, is to achieve equal status with the oppressor, so that we too can fully enjoy the fruits of white supremacy, even if it means casting aside those who are impoverished and discriminated against in our own communities under the shadow of the model minority myth. But there are those in our communities who stand on the other side. As Akai Gurley’s family members spoke that day, they were surrounded by young Asian-American activists, some raising their fists in the air. They were members of the Committee Against Anti-Asian Violence (CAAAV), a pan-Asian community organization based in Chinatown that helps low-income Asian immigrants and refugees living in the city. Founded in 1986, the group opposes institutional racism, and from the beginning has called for the indictment of Peter Liang despite relentless attacks from pro-Liang groups. As snow began to fall onto the sidewalk, Cathy Dang, executive director of CAAAV, stood before the cameras and recited the names of two Asian-American men beaten by the Police Department: Peter Yew, a young Chinese-American engineer living in New York City who was brutalized by cops during a traffic stop in 1975; and Kang Wong, an 84-year-old Chinese man, who was battered in 2014 for allegedly “jaywalking.” In both cases, Dang pointed out, it was black communities that stood on the front lines with Asian-American protesters. From the internment of Japanese Americans in the 1940s to the brutal murder of Vincent Chin in 1982, Asian Americans have often been on the side of the oppressed rather than the oppressor. As writer I.Y. Lee writes in her essay “Are We Trayvon Martin?,” Grace Lee Boggs, Yuri Kochiyama, and other Asian-American leaders worked closely with black organizers, including Malcolm X, during the civil-rights movement, reifying the Afro-Asian solidarity that raged against a system bent on dividing people of color. As antiblack racism permeates almost every facet of society today, we need to ask ourselves once again: Whose side are we on? Peter Liang killed Akai Gurley. As Gurley lay dying, Liang didn’t call the ambulance. He didn’t offer any medical assistance. In that moment, he deprived a parent of a son and a child of a father. No, this verdict wasn’t a tragedy. No, there weren’t two victims. Peter Liang is part of a racist system that tries to tell us black lives don’t matter. We must stand with Akai Gurley’s family in opposition to any appeal of Liang’s conviction, call for systemic change in the Police Department, and demand all police officers be held accountable. Until we see the loss of Akai Gurley as the loss of our own, we are complicit in the cycle of systemic racism—and our own oppression. Lisa TorioTwitterLisa Torio is a freelance journalist based in Tokyo and a former Nation intern.